Scoop the fish into a non-reactive bowl and mix in the onion, black pepper and lime juice. Refrigerate, stirring frequently, for 45 minutes. 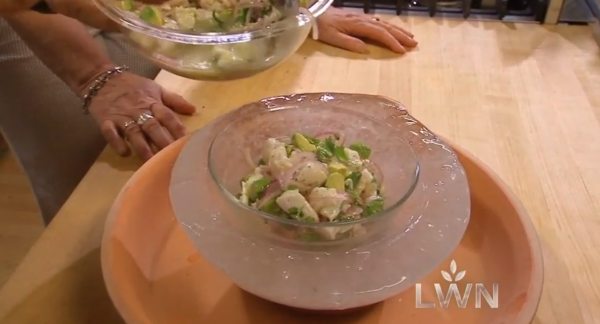 Season the ceviche highly with salt (usually about 1 teaspoon)—keeping in mind that the saltiness of the juice will dissipate as the fish absorbs the flavors. Spread the ceviche onto a smallish deep platter, then dot with the avocado and cilantro leaves. You’re ready to serve. Hello!! Rick, I was at the Cadcabel show at Lookgglass Theatre. I have to know which ceviche recipe and which mole recipe you used. They are the only ones my “discerning” palate will accept. Please let me know as I have your cook books and would love to replicate them.